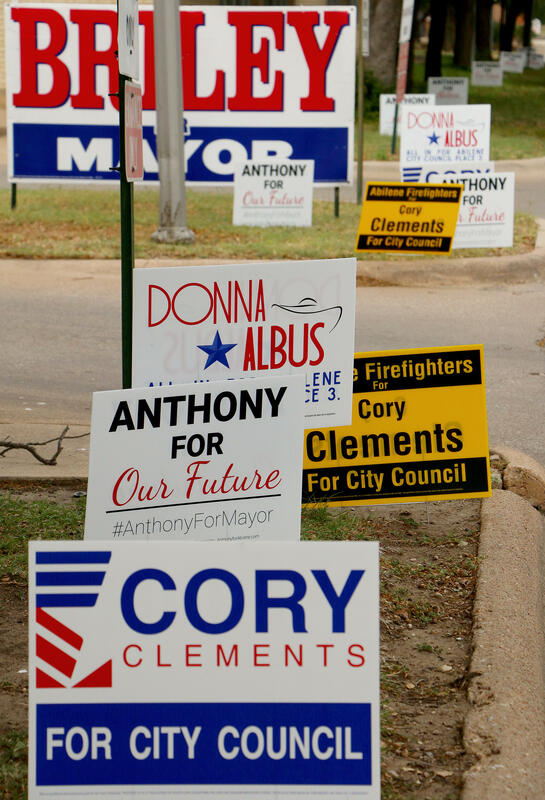 Early voting numbers are up after 1,024 people voted in person on Tuesday and 850 people voted early on Monday. Abilene City Hall, 555 Walnut St., April 24-28 8:00 a.m.-5:00 p.m., May 1-2 8:00 a.m.-5:00 p.m.
Taylor County Plaza, 400 Oak St. Suite 101, April 24-28 8:00 a.m.-5:00 p.m., May 1-2 8:00 a.m.-5:00 p.m. Mall of Abilene, 4310 Buffalo Gap Rd., April 24-28 10:00 a.m.-6:00 p.m., May 1-2 10:00 a.m.-6:00 p.m.
United – N.10th & Willis, 920 North Willis St., April 24-28 10:00 a.m.-6:00 p.m., May 1-2 10:00 a.m.-6:00 p.m.
Tye City Hall, 205 North St., April 24-28 8:00 a.m.-5:00 p.m., May 1-2 7:00 a.m.-7:00 p.m.
Merkel ISD Administration Building, 300 Ash St., April 24-28 8:00 a.m.-4:00 p.m., May 1-2 8:00 a.m.-4:00 p.m.
Trent City Hall, 101 N. Main St., April 24-28, 8:00 a.m.-1:00 p.m., May 1-2 7:00 a.m.-7:00 p.m.
Trent ISD Administration Building​, 12821 E 1-20, April 24-28, 8:00 a.m.-3:00 p.m., May 1-2 8:00 a.m.-3:00 p.m.
Jim Ned CISD Administration Building, 830 Garza St., April 24-27 7:30 a.m.-4:30 p.m., May 1-2 7:30 a.m.-4:00 p.m.
Tuscola City Hall, 418 Graham St., April 24-27 8:30 a.m.-12:00 p.m., May 1-2 7:00 a.m.-7:00 p.m.